Pandora started charging for its streaming music service back in 2013. Back then, Pandora gave users 40 free hours of streaming music a month. After the 40 hours was reached, subscribers paid 99 cents a month for unlimited streaming. But those days are gone. Now, subscribers have three different options. 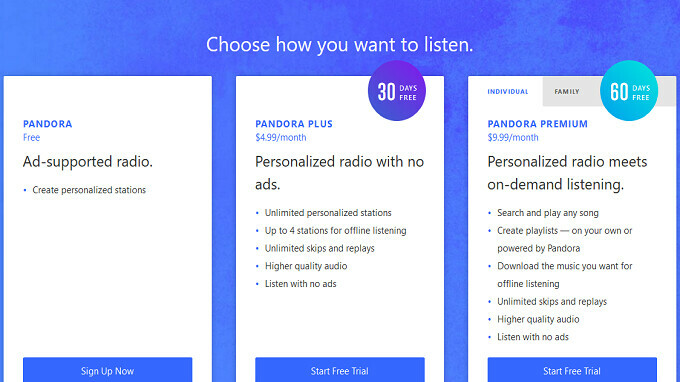 There is an ad supported version of Pandora with limited features, which is free. For $4.99 a month per person, Pandora Plus is ad-free, offers higher quality audio with unlimited skips and replays, and comes with unlimited personalized stations. Up to four of these stations can be played offline. There is a one month free trial. Pandora Premium costs $9.99 a month per person, and allows members to search for and play any song. Subscribers can create their own playlists, or rely on Pandora to create one for them. With Pandora Premium users can download the music that they want to hear offline. The audio is streamed at a higher quality, and there are no ads. Starting today, Pandora has added a Premium Family Plan. As many as six members of a family can sign up for $14.99 per month and receive the same features offered to Pandora Premium subscribers. Premium subscribers can get a two-month free trial.